Genoa is the capital region of Liguria and lies in the gulf of Genoa 'Golfo di Genova', the northern bay of the Ligurian Sea on the northwest coast of Italy, not far from the French border. Genoa is a city of architectural and cultural treasures. It is Italy's most powerful commercial seaport. Genoa is a vertical city and the sky feels so close that a tourist can feel sometimes dizzy. A tour of Genoa promises an experience of dense and fascinating medieval narrow alleyways, Romanesque and Baroque churches, aristocratic castles and sculpted monuments. Check this informative Genoa travel guide. You can take a flight to Cristoforo Colombo airport to embark on your Genoa tour. 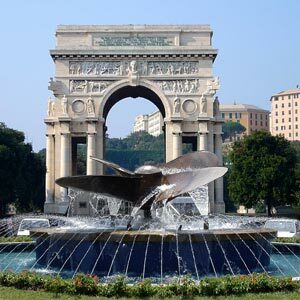 With frequent connections from major Italian cities, you can take a convenient train to Genoa. Ferries from most Mediterranean ports are yet another wonderful way to explore Genoa. Genoa shares a secret beauty which can be found in its daring architecture, splendid frescoes and imposing monuments standing austere witness to the baroque architecture. Try out the trattorias, restaurants and lounge bars around the Piazza De Ferraris. You can spend an evening out near the Porto Antico enjoying a movie, nightclub or shopping. Catch some live music at the Jazz Clubs or a wonderful theater experience at Teatro Carlo Felice. Most guided tours start in Piazza Matteotti in front of the Duchy palace. Normally it is advised to book tickets for the tours 48 hours in advance. Tickets are sold at the museum Palazzo Rosso, Palazzo Bianco or Palazzo Tursi. Usually tours are operated in Italian. English and French speaking guides are available on request. It is surprising to note that sea food is not the hot favorite with Genoese despite its location on the sea. Genoese prefer simple and delicious food like traditional breads, Focaccia and the Farinata. Focaccia is a delicious flatbread stuffed with cheese or topped with an array of vegetables and herbs. Pure olive oil is used for baking. Farinata is a lightly fried specialty made from chickpea flour. This is often stuffed with spinach and ricotta and served plain or topped with walnut sauce. Traditional bread is pissalandrea named after Admiral Andrea Doria. Pesto is the favorite basil sauce made with a mixture of basil, pecorino and parmigiano cheese, garlic, olive oil and pine nuts, ladled over pasta, tossed into salads and mixed into soups. This should take about two hours for the tourist to explore the old town center and its many attractions. This is normally a guided tour and starts with Piazza Matteotti located in front of the fascinating and utterly beautiful facade of the Duchy palace. The maze of streets in the historic center is sure to captivate a visitor. The baroque Chiesa del Gesu and the Opera house Carlo Felice can be found enroute. The narrow medieval alleys, the beautiful historical building and the squares of this largest old town center in Europe leads the tourist to Christopher Columbus' house in Piazza Dante and the majestic cathedral of San Lorenzo. This tour ends in old port area which is a rare combination of modern and industrial archeology and urban restoration designed by Renzo Piano in 1992. A tourist can look around Strada Nuova or Via Aurea, which is considered as one of the monumental roads in Italy and used as a model for subsequent expansions throughout the city. This road is the location for thirteen important buildings of the aristocratic families. These buildings stand witness to the extraordinary masterpieces of Genoese architecture. The port of Genoa contains an ancient lighthouse called 'La Lanterna' which is the oldest working lighthouse in the world. This is one of the five tallest ones and the tallest brick one, a distinct landmark of Genoa. The Genoa Aquarium is housed in a building on the Spinola Bridge and boasts as one of the biggest and most up-to-date sea parks in Europe. This adventurous aquatic tour takes the tourist from the Mediterranean Sea beds to a Madagascar lagoon with mangrove forests to the jungle of hummingbirds from Antarctic waters to delicate coral reefs bouncing with life and color. The tour of the Antarctic National Museum offers the tourist a new adventure over and under the ice to discover the great cetaceans and sea birds migrations towards Antarctica. The museum can be said to be a window that opens up onto the continent of the South Pole. Galata Maritime Museum is the largest maritime museum in the Mediterranean with more than 10,000 meters of exhibition space. This tour is a journey through time from galleys to transatlantic ships capturing the essence of five hundred years of challenges at sea from medieval ages till today. A visit to the Bigo Tower is usually an unguided tour from the sky on a spectacular panoramic rotating lift. It offers a fascinating view of the old town and the busy port. Designed by the Italian architect Renzo Piano, the tourist gets atop forty meters by lift for a spectacular, amusing experience with soft music playing in the background and visuals explaining simultaneously the city structure, not to miss destinations and other landmarks.